Parents lament that babies don't come with instructions, but the real problem is that they come with so much stuff -- and it multiplies as they get older. 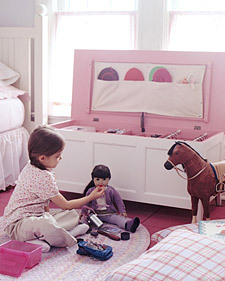 Control this chaos early: Buy a child-safe chest -- one with features to keep it from closing and sealing shut -- and customize it to your child's needs. We added a few molding strips inside and built a simple frame under the lid, then put these modifications to use in each of three toy boxes. The molding supports a false bottom in a baby's chest; later slip in vertical dividers, curtain rods, and storage bins, and you've got a place for everything. Have a lightweight acrylic mirror (available at home stores) cut to fit snugly inside the under-lid frame, and attach it with double-sided mounting tape, Velcro, or mirror clips. For a divider, cut the canvas to the inside length of the chest and twice its width; add 1/2 inch to all sides for seam allowance. Fold it in half, right sides facing, and sew the perimeter, leaving a 4-inch opening. Turn it right-side out and hand-sew it closed. To finish, topstitch all the way around, 1/2 inch from the edge. Attach the divider with screw-snap fasteners according to instructions that come with the kit. New paint, dividers, and accessories transform the baby's chest into a garage for an older boy's toy cars. 1. Use reflective and colored tape to add racing stripes to the outside. For the decal, trace the outline of a plate onto black self-adhesive shelf liner, then add peel-and-stick mailbox numbers. 2. Under the hood: We painted the area inside the frame with magnetic paint so this little racer can stick up photos of his dream cars. Apply three coats of magnetic paint, and then one coat of the color of your choice. Clear mailing tubes from an office-supplies store hold race-car tracks. Tubes can be cut shorter with a hacksaw and attached to the lid with bungee cords and screw eyes. 3. Two panels of 1/4-inch-thick Peg-Board are cut to fit inside the chest vertically and held upright between the molding strips. Cars are "parked" on clear plastic shelves made for Peg-Board. Other accessories, such as spare parts and batteries, are organized in clear containers. 1. Cut the molding into 12 equal pieces as follows: First, cut four pieces, each 1/2 inch shorter than the inside length of the chest. Then cut these into precise thirds. Place two pieces along the bottom of the chest at the back, each flush with a corner; affix using wood glue and brads, countersinking the brads. Center a third piece of molding between the first two (there should be slightly more than a 1/4-inch gap between each piece), and attach. Repeat at the inside front of the chest. 2. Attach the remaining six pieces of molding (curved sides down) along the front and back of the chest, 4 or 5 inches down from the top. If you like, you can also add molding strips to each end of the chest. 3. Use more molding to make a frame for the lid. We attached two pieces between existing supports. To make the accessory pocket, cut a piece of canvas to the inside length of the under-lid frame and 3 1/3 times its height. Fold fabric in half crosswise, right sides facing; sew perimeter leaving a 4-inch opening. Turn it right-side out and hand-sew it closed. Fold the bottom edge up 2/3 of the way; stitch the sides. Then stitch perpendicular to the fold to create four smaller pockets. Attach the pocket with five screw-snap fasteners, according to instructions that come with the kit. For a window seat, cut a piece of 3/4-inch plywood and a piece of 1/2-inch-thick foam padding so both are 1/2 inch smaller than the dimensions of the lid. Cut the batting 2 inches larger than the plywood and cut the upholstery fabric 4 inches larger than the plywood. Stack in this order, from bottom: fabric (face down), batting, foam, plywood. Pull the fabric taut; staple to the back of the plywood with a staple gun. Attach the covered plywood to the lid of the chest from beneath with 1-inch screws. Dolls have such extensive wardrobes these days, they could use a closet all their own. Here, our baby chest blossoms to organize it all -- and becomes a practical piece of furniture, too. 1. Along with a new coat of paint to match the decor, the chest gets a comfy padded top. 2. A set of pockets holds hats, ribbons, and brushes; it's a simple sewing job with canvas and snaps. 3. Doll clothes hang on tension rods. Sliding trays keep shoes, bags, and more. To make them, we glued together and painted wooden cutlery trays; they rest on the moldings we installed inside the chest. Clear plastic sewing boxes store small dolls and additional accessories. Labeling storage boxes and trays helps kids put everything back where it belongs. If you like, you can create dividers for the bottom of the chest by slipping some Peg-Board panels between the strips of molding.